Last year a group of the moderators at Jeep Horizons (CoreyXJ, KeithTJ and myself) thought it would be a good idea for a bunch of us to get together and go wheeling. We decided to do it at Land Between the Lakes in western Kentucky. 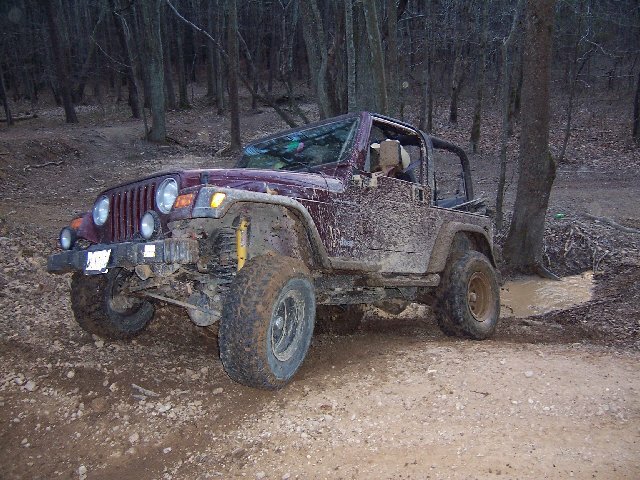 We choose late March because we wanted to go wheeling together before Corey left for Wyotech in early April. So, after months of planning it was finally here...and it turned out to be a blast. Despite the predictions of bad weather we had 2 absolutely gorgeous days...all the rain held off until Sunday. There's a lot that happened and a lot of pics....so we'll get right into it - after Jen and I made the 11.5 hour trek into western Kentucky I noticed this. After everyone showed up we hit the OHV trails. By the time we made it down there it was already mid afternoon, but we still had a good day. The standard lineup shot. From left to right: Ryan (ShawnWJ's brother), Jen(2Goofy), Corey(XJ), me, Keith(TJ) and Matt (Kygreenyj). On the ATV's that's Greg (G. Shucks), Eric and Issac. Where that pic was taken is just a clearing with a whole bunch of mud puddles. So Ryan took the oppurtunity to bust the cherry on his ZJ. He was doing like 40 and almost ended up rollling it...he was on 2 wheels at one point. We knew right then it was gonna be a good weekend. After she was out we decided to press on and keep looking for the pit...of course then I got stuck and Corey had to strap me out. Did I mention that the guys on the ATV's were having a blast too? This was funny...KTJ was having some problems taking the same little climb/obstacle. As we all began to detect the sweet smell of a burning clutch, he got out to look at his line and Corey jumped in and took over. Then, to add insult to injury...Corey backed down and did it again over the harder line. 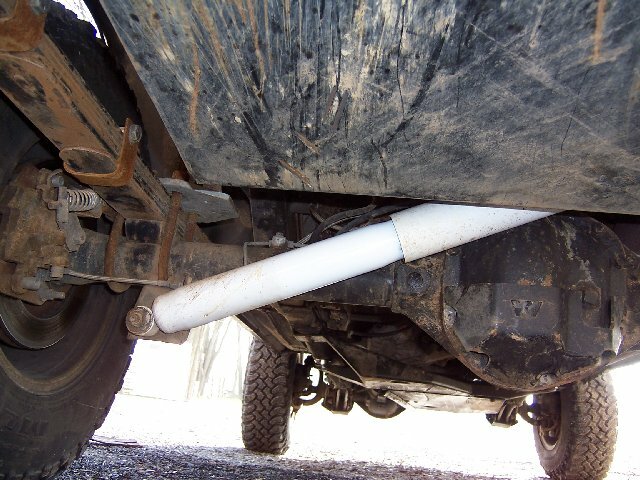 Anyway that was about it...for wheeling at least. We went back to the cabins and met up with the rest of the group. There was much drinking, arguing over basketball, a discussion over the intelligence of horses, at least one drunken phone call (to Troy)...you get the idea. Got out to the OHV trails around 10 or so. Went to the same spot for another lineup pic, but never really got it...Ryan, Shawn(WJ), and John (Fruitstripe) just went right at the mud puddles. The first third and the last third were not too difficult....it was the middle third that was tough. It would have been easy for someone on 35's or 37's...but on 30's it was a challenge. We ended up winching it forward 6-8 inches at a time. The front drivers wheel was wedged in good and the back wheel was barely hanging on. If we tried to move the front end in the direction it needed to go the back wheel was going to slip and put the Jeep on it's side. We got out of it because of Carl. Carl was a guy on an ATV who wedged it against a tree and used his winch on my rear axle to hold it in place while we used my winch to free the front wheel. After almost 3 hours and gathering a crowd of about 40 people, including 2 park rangers...we pushed it through. The only damage being misaligned steering and a dented rear bumper. I take no credit for getting the XJ through it....I might have been in the Jeep, but it was Corey, Eric, Issac, Greg and Ryan that pushed me through it...either with spotting or by sheer muscle. Oh...and Carl? He burned up his winch keeping me from rolling. When I offered to pay for it, he refused saying "Just glad I could help." Onto more wheeling...while we were playing in what we later found out was called Buttpuckers Gulch, Shawn and John managed to find the Gator Pit. Turns out that it had been filled in and wasn't that big of a deal anymore. Eric and Issac started measuring some of the other puddles with a stick and told Matt that he could make this one. hmmmm...I think they lied. So Shawn got to bust his recovery cherry strapping him out. Then Shawn managed to get stuck as well. I ended up having to winch him out because there was no room to strap him without getting stuck myself. I don't have any pics of that one. By this time it was 4pm and none of us had really eaten since breakfast. So we headed back down to the staging area, collected some firewood and headed back to camp....after all that's where the beer was. We also realized that John should not be allowed to have the lighter fluid. Like I said at the top...it was a blast! The above only scratches the surface of the fun we had. It was great to meet these folks and I, for one, am looking forward to doing it again. We are already talking about having next years run here in VA. I'll tell you right now that we'd (FM2CD) be more than happy to host it. Anywayz, that's about all. 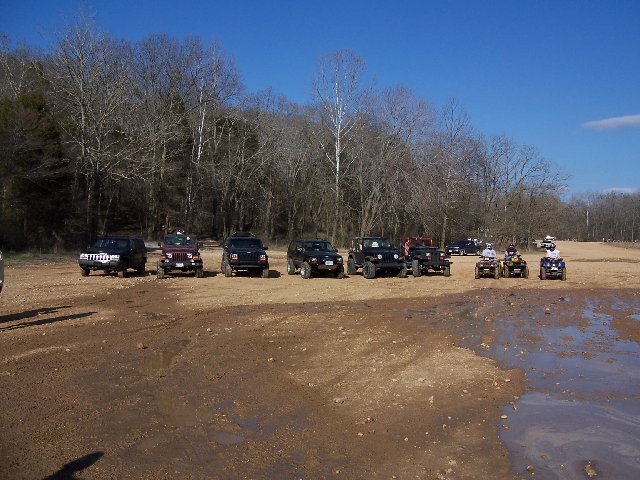 You can also read the list of what we learned at the '05 Jeep Horizons Run. Corey, good luck and have fun at Wyotech for the next 9 or so months. J.Ho. has left the trail! The next J.Ho. gathering will be at Paragon in July.